In most cases a successful solvent cement joint can be made without using a primer/cleaner. But, if you want to increase probability of making a successful joint, using a primer/cleaner is the thing to do. 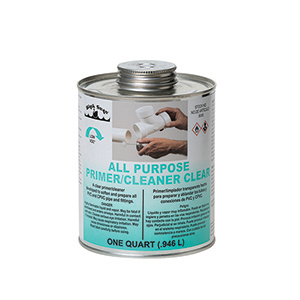 All Purpose Primer/Cleaner (Clear) accomplishes two things. First, it will clean the pipe and fittings of any dirt, oil, grease and other foreign matter. If the plastic is dirty before making a connection it will be more difficult for the cement to bond the pipe and fitting together. Second, All Purpose Primer/Cleaner (Clear) will soften the plastic. This allows the cement the opportunity of skipping a step (softening the plastic) and to go immediately to the process of fusing the pipe and fitting together. Note – softening the plastic in cold weather is especially important because it will noticeably speed up the process of making a solvent cement joint. Using All Purpose Primer/Cleaner (Clear) is always recommended to make a good connection.